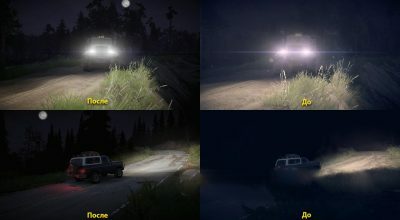 Graphic mod improves the atmosphere of the game. 1- Replaces the original game loot cards to return natural colors. 2- Removes noise at night. 3- Removes stains on the camera. 4- Changes the weather and making the atmosphere of the game enjoyable. 5- Headlights, dimensions, brake lights, reverse looks much better. 6- Turns off daytime headlights. 7- Turns off street lights during the day. 8- Fixed blue water in the rivers and a bit of green water. 9- Improved texture of logs (there are 2 options). Absolutely from scratch he drew. 10- Added the moon to the night sky (New! ), As well as the option – Remove the moon. 11- Option – Original gas grid 66. 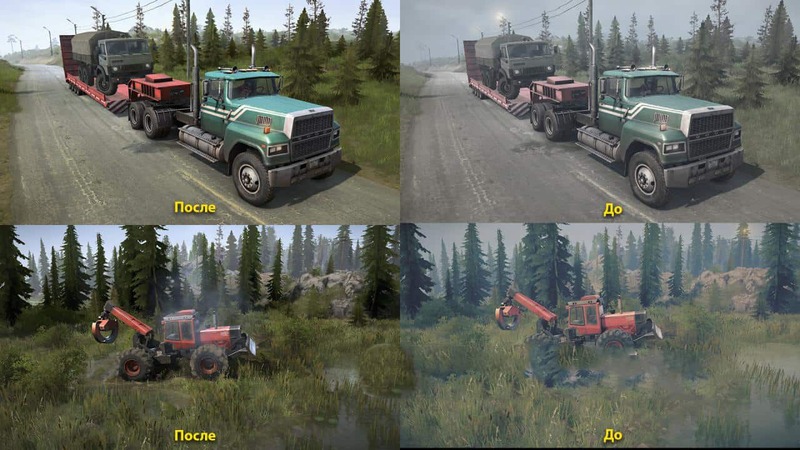 12- Option – Return the pieces of dirt on the wheels. 13- Improves the appearance of the winch cable. 1. Download * Realistic graphics without loss *. 2. Unpack the archive in any place. 3. 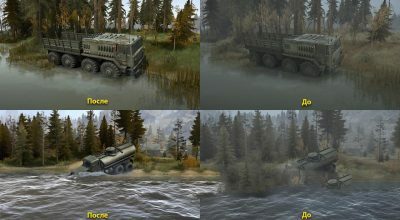 Copy all files from the folder of the required version (Main mode or Almost white nights) to the root directory of the game. We agree to replace the files. 4. Run the file * Clear the cache (without resetting the game). Bat * to clear the cache. Be sure to !!! 6. Start the game and enjoy! 7. For a network game you need to put a check mark in SpintiresMod * Disable file checking *. 8. By default, the new texture of logs # 2 is installed, but there are two options to choose from, and you can also return the original texture of the logs. You can simply drop the desired texture into the TextureCache folder. P.S. Fps does not squander at all. The mod is a copy of the mod version * Realistic graphics + fix ReShade & ST mod *, but only without configured ReShade. In the folder * The main mod * is more realistic. In the folder * Almost white nights * – this is a mod with a lighter night. 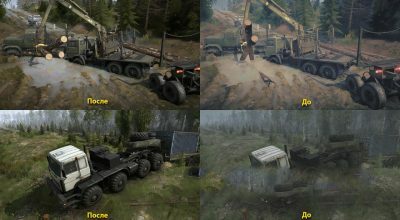 In the folder * Add-ons and Demonstration * – additional options: new textures of logs, return pieces of dirt to the wheels, the original GAZ-66 grid, remove the moon and screenshots of new changes. I hope you enjoy the mod. – The weather has been edited. – Redid the mod and made options according to the vote. – Correction of errors due to inattention.